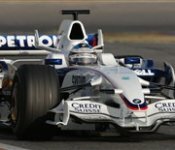 Just a few weeks prior to the start of the 2008 Formula One season, the drivers, Nick Heidfeld and Robert Kubica, aren't the only ones to work hard on improving their stamina. Currently, all the other BMW Sauber F1 Team members also execute a fitness programme to get in perfect physical condition for the season kick-off held in Melbourne, Australia. Just as it was the case in recent years, the Munich and Hinwil based squad again doesn't leave anything to chance, in 2008, when it comes to preparing for the new season. On the hunt for its maiden race win in Formula One, the BMW Sauber F1 Team prepares with the motto "Fit for Pole" for its third season at the pinnacle of motor racing. An initiative inspiring Mario Theissen. "A boost for the team spirit and competitiveness," says the BMW Motorsport Director. "Years ago, we started a programme called "Fit for Pole". A programme that produced amazing effects. And certainly it doesn't do any harm that the boss is sweating, too."